Slimline Gel Nail Polish is a hybrid nail varnish that goes on as effortlessly as ordinary nail polish but remains perfect for a minimum of 14 days with the appropriate application. The Slimline Nail Polish brand are a long-lasting, high-quality, hundreds of range gel color style nail polishes which include various textures, glitters, color changing and classical ranges. Slimline Gel Nail Varnish requires the use of a 35v UV lamp or LED light to cure the nail polish gel. It will not set properly without this step. Top coats are used to seal polishes and make the nails shinier and prevents chipping. One thin layer for durable protection and mirror-like shine that removes in minutes with no nail damage*. 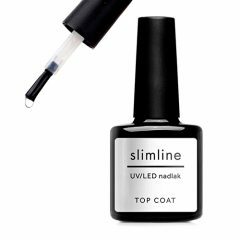 Slimline UV/LED polishSlimline Gel Nail Polish is a hybrid nail varnish that goes on as effortlessly as ordinary nail polish but remains perfect for a minimum of 14 days with the appropriate application. The Slimline Nail Polish brand are a long-lasting, high-quality, hundreds of range gel color style nail polishes which include various textures, glitters, color changing and classical ranges. 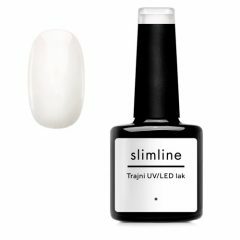 Slimline Gel Nail Varnish requires the use of a 35v UV lamp or LED light to cure the nail polish gel. It will not set properly without this step.